Although a sandwich may be one of the most common easy snacks, they're not all simple. Here you can see some of the fun and tasty different types of sandwiches you can make. Bread. It's a part of most people's daily lives and you use it in a huge range of things - from bread crumbs to bread and butter pudding. It forms an integral part of most people's diets and comes in a huge range of types - from sour dough to multigrain, white and wholemeal. The sandwich. It's a popular food that can be very versatile - because you can make it exactly how you want! Whether you like it crustless, toasted, cut, stacked or just thrown together in a hurry, it's completely up to you what you create. Below you'll find a list of some of the more fun and popular uses for bread - and not just any normal sandwich. So next time you get bored - try something different with your bread! The idea of a sandwich is older - meat and vegies were commonly eaten with bread many millennia ago. Lord Sandwich merely gave a name to this delicious and simple treat. The story goes that Lord Sandwich was too busy playing a game of cards to bother eating. He instructed his valet to throw a slice of meat between two pieces of bread and bring it to him so he could continue his game. Many restaurants serve gourmet open sandwiches which may have one slice of bread covered with meat such as steak and the other slice laid with a variety of salads. An open sandwich is the name given to a single slice of or more of bread, laid flat and topped with ingredients without a second layer of bread on top. Hot toast is great for spreads that melt or thin in hot temperatures - like butter or cream. Another alternative is to spread your toast with a food whose flavor is increased by heat - such as garlic or onion. It's been said that toast is the best thing since sliced bread. Toast is simply the processing of cooking or browning the outside of the bread, leaving it crispy and crunchy while the inside remains soft. Just make sure you don't make it so big that it can't fit in your mouth! If you like your sandwich to be a bit different - a stacker sandwich is the perfect solution. Instead of using two slices of bread to make your sandwich, use three, four or even more! Put something different between each layer - salad in one, spread in another and maybe something crunchy in the next. A stacker sandwich is not only a great taste sensation but decreases the chance of your ingredients falling out like they do in a single layer sandwich. Don't think art sandwiches are just for kids though! Get in there and create your own awesome sandwich design. This is a great idea for kids. Get some slices of bread, a knife (with supervision) and a range of sandwich ingredients. Colorful sliced salads such as capsicum, carrot, cheese and beetroot are great for this. Colorful spreads you can use include relish, chutney and jam. Let the kids slice up the bread into shapes such as squares and triangles. Give them a plate each to design their creation on - then let them go wild with colorful salads and spreads to create whatever they want - from a truck to a butterfly. There are plenty of ways to create a toasted sandwich - some common ways include toasting the sandwich in a frypan, in a stove top toaster or in an electronic toasted sandwich maker. A toasted sandwich (also known as a jaffle or toastie) is different than toast because the ingredients are heated with the bread, instead of being added later. Popular ingredients for designer sandwiches include carefully layered cucumber, dill and water cress. Designer sandwiches are usually an attempt by chefs and the upper class to make a simple sandwich appear a bit more grand. Usually designer sandwiches are cut into triangles and have the crusts cut off. Definitely a taste treat for anyone looking for a different type of sandwich! 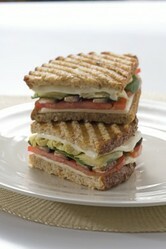 A panini is a traditional italian sandwich that is now popular worldwide. The sandwich is made using a small, long loaf of bread that is cut length wise. Usual ingredients for panini include cheese, salami and ham as well as a variety of other salads and meats. Paninis are often cooked in a panini press leaving them hot and with a lined exterior pattern which makes for a unique texture in the mouth. Panini is just another word for 'sandwich'. They became popular outside Italy in the 1950s. Rolls are great for picnics or barbecues and any event that requires you to make your own - since until they're cut they keep their soft centre. Bread rolls are another great way to make a sandwich - although the traditional name is a burger. Unlike a piece of bread, a roll is usually cooked on it's own and is a smaller size as a whole, meaning the exterior is more crusty. Great if you feel like pizza but just don't have the appetite or someone to share a full one with. Pizza toast is another great way to eat your bread - it's a grilled open sandwich of sorts. Simply build a small pizza using ingredients such as tomato paste, olives, capsicum, tomato, onion and cheese then pop it in the oven.